What? Cherries and chocolate and coconut and nuts? And oats? Is this possible? Indeed it is, and its delicious, too. My boys like granola bars, and believe that they’re a healthy snack. I believe that granola bars are just cookies disguised as a healthy snack. And they remind me of the English version of flapjacks, which I love a lot. I have no problem with my boys eating cookies, or other sweet snacks, but if they’re going to eat something unhealthy, I’m going to make it for them myself, dammit! For some reason I feel better knowing that they’re getting actual butter and sugar rather than processed blizz blazz. It might seem silly, but there it is! Plus these have oats and nuts and fruit, so there’s some good with the bad. Obviously, you can throw anything you like in there! Don’t not make them because you don’t have all of these specific ingredients! I had fewer chocolate chips than I thought, so I threw some mini M&Ms left over from Isaac’s birthday into the mix. I think of oats and chocolate as being ultimately comforting. And I’ve always wanted to make a playlist of empathetic songs. Songs like the magnificent It Hurts Me Too, by Elmore James. So I’ve compiled such a list, and I love it, so far. Some of the songs might be more sympathetic than empathetic – it’s a fairly liquid shift from one to the other, isn’t it? But they’re all supportive and comforting. Can you think of any songs to add to the list? In a large frying pan over medium heat, toast the oats, nuts, cinnamon, and coconut for about five minutes, till the mixture smells lovely and toasty and starts to brown slightly. Stir/shake the pan frequently so it doesn’t burn. Pour the mixture into a large bowl. Soak the cherries in just enough boiling water to cover for about five minutes. Briefly process or roughly chop. preheat the oven to 350. Lightly butter a brownie pan or roasting pan. In the same pan, also over medium heat, melt the butter. Add the sugar and golden syrup. When everything is melted and starting to bubble, stir in the oats, nuts, coconut, malt powder, till everything is coated and sticky. Remove from the heat and stir in the cherries and chocolate chips. Press the mixture into the pan. It should be about 1/2 inch thick. Bake for about 25 minutes, till it’s starting to brown on the edges. Let it cool for a few minutes, and then score into squares. Let cool completely before removing from the pan. 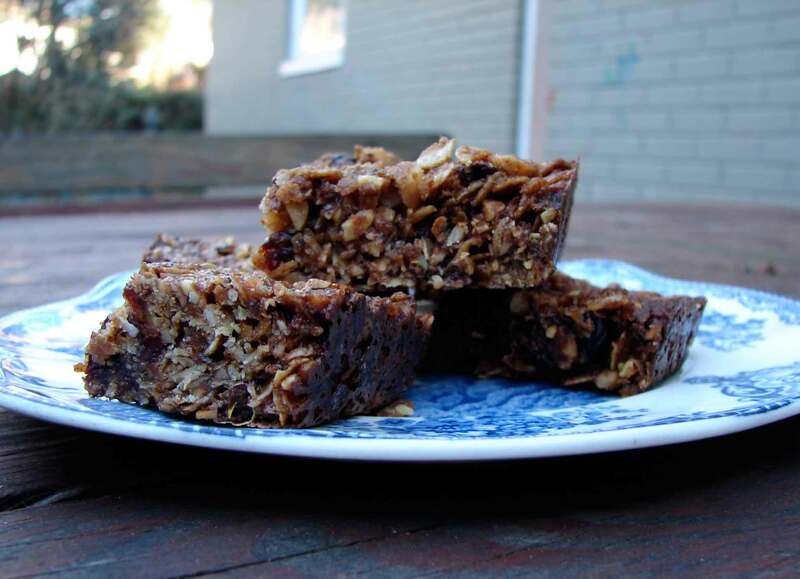 This entry was posted in cake, chocolate, cookie, dessert, recipe and tagged bar cookies, coconut bars, dried cherries, flap jacks, golden syrup, granola bars, nut bars by Claire. Bookmark the permalink. I can’t add anything to your playlist ! ! ! Have you made it collaborative? It has a different symbol from the RR ones. I didn’t make it collaborative because I feel more responsible for this one. But what the heck! I’ll fix it now, and you should be able to add your songs. Oh no – I’m sorry! Don’t do it if you don’t want to. Naw, it’s fine. It’s not as if too many people read this anyway! Just before my parents’ wedding, my mother’s father had a chat with her and said if she had any doubts at all about getting married, she mustn’t worry about the money that had been spent, or the presents, or what people would think; that she just had to say and he would sort it all out with everybody. But my mother was pretty pigheaded (and so am I)…I think this is such an important message, especially for young people – that no matter what you’ve decided it’s OK to change your mind and, if there’s someone there to support you, that will make it easier. Yum, this sounds delicious. Love flapjack. Thanks for sharing this. Thanks! I love flapjack, too, but we don’t see too much of it here in the US.